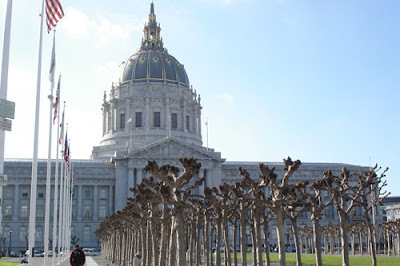 SF City Hall. Photo by John Han. The San Francisco Public Safety Committee approved legislation Thursday making it a misdemeanor to provide taxicab service in the City without proper permits. Supervisors Ross Mirkirimi and Malia Cohen voted in favor of the ordinance. Supervisor David Campos was absent. The law includes allowing SFMTA to hire taxi investigators to issue up to $5000 in fines and impound vehicles that have been caught operating as taxicabs without permits. A handful of taxi drivers and company reps, during public comment, unanimously supported the law. But an attorney representing Uber, a town car and limousine dispatch service opposed it, saying it will wrongfully prohibit licensed limousine drivers from picking up passengers in San Francisco who are using its service. The law is sponsored by president of the Board of Supervisors David Chiu. It is expected to be heard at the full Board of Supervisors meeting Tuesday, March 1, 2011. As far as the details of what should be in a uniform lease agreement, a taxi town hall meeting is scheduled for Tuesday, February 22, 2011 for review and discussion, as there are no details to date. It was suggested that cab companies volunteer viewings of the lease agreements they already use at their companies, so that an aggregate of existing agreements from various companies could serve as a skeletal reference or template. The meeting will be held in the 2nd Floor Atrium, 1 South Vanness Avenue, 2 to 5 pm, and 5:30 to 8:30 pm. The revisions to contracts are being dragged out in a more public way than is needed. Time is being wasted, and if this drags on we are going to get an elephant designed by a committee. Most or all of the major companies use a variant of the Yellow contract. Why don't they, together with the City, just look at the Yellow contract, and articulate their exceptions to that template. THAT SHOULD BE THE AGENDA FOR THE TOWN HALL MEETING. This time Chris Hayashi is working too hard - she created a not unreasonable contract, but without referencing existing ones. Collating a new contract with any existing contracts is a necessary step either way. The Town Hall Meeting is not the correct forum for such collation of contracts.